As mentioned in the article discussing Twitter usage during the UEFA European Championships that took place in June, social media usage and sporting events now go hand in hand. Platforms, such as Twitter and Facebook, are used for real time interaction with other spectators and viewers of sporting events and this trend is likely to continue through the London 2012 Olympic Games, which are expected to see the highest amount social media interaction in the events history. Technological developments since the previous Games, held in Beijing in 2008, are likely to be the key reason for rising social media usage during the 2012 event, with more intelligent smartphones released since 2008 and the advent of consumer tablets coming after the Beijing games. The rapid growth of social media and the alterations to media consumption, that mean a vast amount of print and video media are now consumed online via pc’s, tablets and mobiles, will see record social usage during the event as the infographic below reveals. With all events set to be streamed online for the first time it is even more likely that social interaction will occur, as many will be watching the action unfold on a pc or tablet device as opposed to via television. 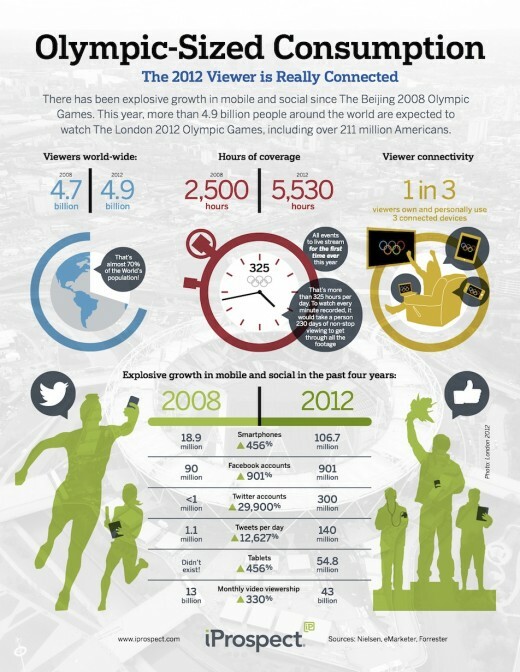 One thing that is for sure is that it will certainly be interesting to see how viewers use social media platforms during the 2012 Games and whether the events will break more records than viewers will online.